By nature, my husband, Joe, and I are sprawlers. We’re tall people. We like room to spread out, to stretch our legs, to live large. There’s nothing diminutive about our living space and its contents. So the invitation to overnight at Mt. 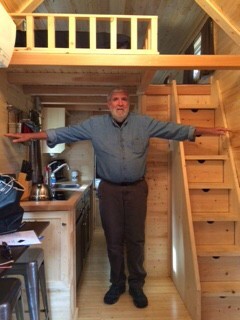 Hood Tiny House Village in Welches, Oregon in a cottage that’s half the size of our family room was not only an opportunity to revel in mountain ambience but the chance to test the compatibility of big travelers and a small space. It seems that tiny is trendy these days. The lure of affordability, minimal maintenance and a more eco-friendly lifestyle is attracting a growing population to small space living—and vacationing. The Tiny House Village, which opened in May 2016, is tucked into the expansive Mt. Hood Village RV Resort along the Salmon River among a collection of vacation cottages, rustic cabins, yurts and wooded RV sites. The cozy cottages create their own attractive neighborhood in a soothing wooded setting. Each Tiny House has its own outdoor grill and picnic table, and all share a fire pit encircled by Adirondack chairs. Had it not been for the downpour, we would have bought s’more fixings at the camp store and spent the evening fireside. Our compact home-sweet-home for a night was half the size of our family room. Built on sturdy trailers by the Tumbleweed Tiny House Company, the novel lodgings range in size from 175 to 261 sq. ft., including loft space, and are unique in design, décor and ambience. Atticus (178 sq. ft.) has a sleek, streamlined masculine vibe and sleeps three. With a cheery yellow exterior accented by red shutters, Savannah (175 sq. ft.), accommodates three in an atmosphere of Southern charm. Scarlett (233 sq. ft.), painted farm house red, sleeps five and includes two lofts with queen-size beds. 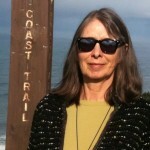 Zoe (196 sq.ft.) has beds for three in a compact space decorated in cool blues and greens. Our temporary home was Lincoln—at 261 sq. ft., the largest in the village and the only pet-friendly option. Outside, Lincoln boasts cedar plank siding with red trim and a welcoming porch. Inside, we discovered knotty pine paneling, colorful pillows, a cozy window seat and streamlined kitchen and dining area. A queen-size bed was nestled in the back with windows on three sides. The bathroom is compact but full-featured. Up a ladder staircase is a loft with a single and double bed—and a very low ceiling. All available nooks and crannies and wall space are commandeered for storage with coat hooks, out-of-the-way shelves and a decent-size closet. Stairs to the loft doubled as our shoe rack. We learned several lessons of Tiny House living immediately. For instance, one does not leave size 10 (me) and size 16 (Joe) shoes on the floor as there’s no room to dodge them. 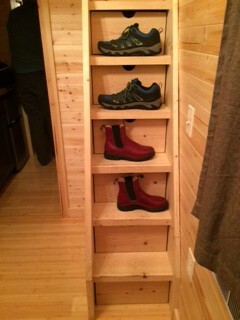 We opted for the ladder to the loft as our shoe rack. And leaving much of anything on counters and tabletops creates an instant sense of clutter, so we stashed our books and snacks and gadgets as best we could. We also discovered that giving advance warning of our respective movements prevented collisions, including opening the bathroom door in the other’s face. And, oh yes, my broad-shouldered husband did need to turn sideways to fit through the bathroom and other doorways. 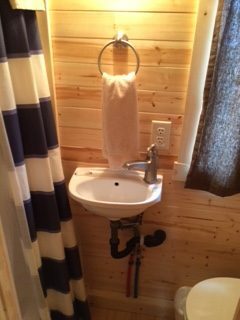 The cozy bathroom requires some careful maneuvering. Door aside, the bathroom is equipped with a 32”x32” shower, full-size toilet and half-size sink. It does, however, take some maneuvering to bend over the sink without opening the door with one’s behind. Though the extent of our cooking was making coffee, the kitchen includes a pair of stove-top burners, microwave and small refrigerator, along with dishes, utensils, coffee and tea. Our cozy bedroom with three windows felt like a treehouse. Air-conditioning, heating and wireless keep guests comfortable and connected. We watched the vice-presidential debate on the wall-mounted flat screen television in toasty comfort. 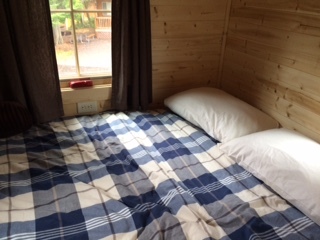 Our bed was snug, with plenty of pillows and quality bedding, and long enough (just barely). With the rain pattering on the metal roof and leafy limbs framing the windows, we felt as if we were sleeping in a tree house. Lincoln’s guest book offered some insights on previous travelers to our Tiny House. A family with 5-and-7-year-old boys “enjoyed tiny living to the extreme” and noted that they were seriously considering Tiny House living. Another pair thought they could handle a Tiny House but not full time. One couple—who became engaged during their stay—found that the simple space represented what was truly important in life. Rates for the Mt. Hood Tiny House Village are $129-$139 per night, and guests can take advantage of the resort’s indoor pool, hot tub, fitness center, walking paths and Dragonfly Café. 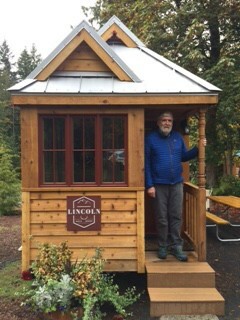 Reservations are recommended at this popular spot—all Tiny Houses were occupied when we overnighted despite the cool, rainy October weather. Next morning, the rain still falling, we headed to Timberline Lodge on Mount Hood for breakfast. Constructed in the 1930s by the Works Progress Administration, the legendary structure was declared a National Historic Monument in 1977. There, amid giant timber posts and beams and seven-foot-high fireplaces, on couches big enough for Paul Bunyan, we sprawled.